Greg Wright, West Region president, UnitedHealthcare Medicare & Retirement (right), helps Benedyne Kim, On Lok Lifeways participant (left), pot a plant while Bob Edmondson, CEO of On Lok (center), looks on at the nonprofit's Spring Volunteer Day with San Francisco Bay Area UnitedHealthcare employees Monday, April 8. The activities were capped off with UnitedHealthcare presenting On Lok an $897,000 grant to strengthen its services to seniors in the region (Photo: Amy Sullivan). SAN FRANCISCO--(BUSINESS WIRE)--On Lok Lifeways has been awarded a $897,240 grant from UnitedHealthcare to help strengthen its health information technology system and delivery of care to San Francisco Bay area seniors through electronic medical records initiatives. The grant is part of $5.2 million UnitedHealthcare is awarding to nine health care organizations to support nonprofit clinics, hospitals and health care organizations that improve health care services for underserved communities statewide. Founded in 1972, On Lok Lifeways in San Francisco is one of the nation’s leading providers of health services including long-term care and support services to seniors. On Lok Lifeways’ pioneering efforts in the Bay Area created “PACE” (the Program of All- inclusive Care for the Elderly), a model of care delivery that has been replicated in 91 organizations in 30 states. The UnitedHealthcare grant will help On Lok Lifeways strengthen its “PACELink” program, which uses health information technology and electronic medical records to improve care and coordination for seniors served by a network of 10 health care and wellness centers in the Bay Area. Specifically, the grant will fund software improvements, technology investments and training that will provide greater efficiencies in the coordination of care through the automation of scheduling, clinic appointments, transportation, home-visit reporting, medication distribution and pharmacy prescriptions. 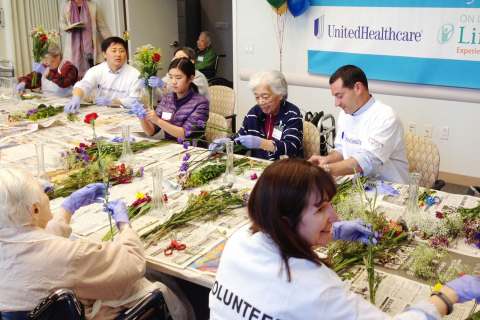 The grant was announced during a volunteer day at On Lok’s Gee Senior Center, 1333 Bush St. in downtown San Francisco, where UnitedHealthcare employees joined community leaders to help On Lok Lifeways seniors plant a vegetable garden, plant flowers in hand-painted pots and make flower arrangements, among other activities. 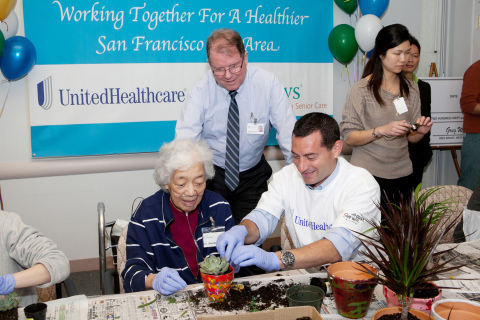 The volunteer event was part of UnitedHealthcare’s ongoing commitment to On Lok Lifeways and its mission of serving Bay Area seniors. In 2009, UnitedHealthcare also provided a $250,000 grant to On Lok to launch an electronic medical records initiative. Since 2008, UnitedHealthcare has provided more than $30 million in grants to 53 nonprofits statewide. Nine of them are in the San Francisco Bay Area, receiving $3.1 million. In addition to these grants, UnitedHealthcare’s California Health Care Investment Program has provided $269 million in total investments to 46 health care organizations throughout the state to help underserved, low-income and underinsured communities and populations. This includes $17.5 million to construct the new Institute on Aging facility in San Francisco; $4.6 million to build a new La Clinica de La Raza medical center in Concord; and $6.5 million to help construct the new Petaluma Medical Center. UnitedHealthcare, a UnitedHealth Group (NYSE: UNH) company, serves more than 2.4 million Californians with a care provider network of 320 hospitals and more than 57,000 physicians statewide. For more than 40 years, On Lok has provided comprehensive medical and social services to frail seniors enabling them to live at home as long as possible. On Lok’s health care plan, known as On Lok Lifeways, covers the entire continuum of care for seniors including medical, hospital, home care, transportation, rehabilitation, prescription drugs, and much more. Seniors with full Medicare and Medi-Cal do not have any payments or co-pays for On Lok Lifeways services. For more information about On Lok Lifeways, please visit www.onlok.org or call 1-888-886-6565. On Lok Lifeways has been awarded a $897,240 grant from UnitedHealthcare to help strengthen its health information technology system and delivery of care to San Francisco Bay area seniors.